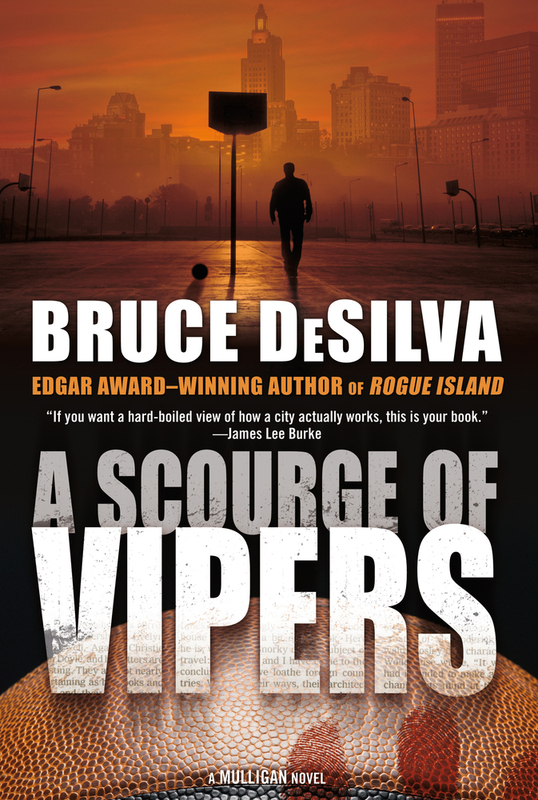 Read an excerpt of A Scourge of Vipers, the newest Liam Mulligan novel from Bruce DeSilva, publishing April 7. A snake—that’s what Mario Zerilli had called me. And now, just an hour later, something was slithering across my cracked kitchen linoleum. It was three feet long with lemon racing stripes twisting the length of its brown body. I watched it slide past the wheezing fridge and veer toward the kitchen table where my bare feet rested on the floor. It raised its head and froze, its forked tongue flickering. It had caught my scent. I pushed back from the table, got down on my knees, and studied it. A pretty thing. I flashed out my right hand and pinched it just behind its head. It writhed, its body a bullwhip. I was startled by its strength. I carried the snake into the bedroom, opened my footlocker, and used my left hand to empty it, tossing a half-dozen New England Patriots and Boston Bruins sweatshirts and a spare blanket onto the bed. Beneath the blanket was a Colt .45 that once belonged to my grandfather. I tossed that on the bed, too. Then I dropped the snake inside, slammed the lid, and started thinking about names. Stop it, I told myself. The garter snake was probably an escaped pet, the property of someone else in the tenement building. How else could it have found its way into my second-floor apartment? When I had the time, I’d ask around, but if no one claimed it, I’d be heading to the pet store for a suitable cage. I could hear the snake blindly exploring inside the footlocker, its scales rasping as they slid against the wood. I couldn’t help myself. I started thinking about names again. Mario leaped to mind. But no, I couldn’t call it that. I liked garter snakes. If Mario had sneaked it in, it would have been a copperhead or a timber rattler. The trouble with Mario started a week ago when his great-uncle, Dominic “Whoosh” Zerilli, and I got together over boilermakers at Hopes, the local press hangout, to talk about the future. I was a newspaper reporter, so I didn’t have one. Whoosh was contemplating retirement. He made a face, the same one I once saw him make when he absentmindedly stuck the coal end of a Lucky Strike in his mouth. Whoosh was a few months short of eighty. He waved the waitress over and ordered us both another round of Bushmills shots with Killian’s chasers. Mario, just twenty-six years old, had already done state time for drunken driving and for using his girlfriend as a tackling dummy. Now he was awaiting trial for kicking the crap out of a transvestite who made the near-fatal mistake of slipping out of the Stable, Providence’s newest gay bar, to smoke a cigarette. But he was Whoosh’s only living blood relative. The punk had inherited the title two years ago when his father was gunned down in a botched East Providence bank robbery. Mario’s grandfather, Whoosh’s only brother, fell to esophageal cancer back in 1997 while serving a ten-year stretch for fencing stolen goods. Whoosh and Maggie did have an adopted daughter; but Lucia, a young mother who performed with a New York City dance troupe, was an unlikely candidate to take over his bookmaking business. My old friend and his wife never had any kids of their own. I’d never had a moral objection to bookmaking, at least not the way Zerilli went about it. Unlike the officially sanctioned gangsters at the Rhode Island Lottery Commission, who peddled chump numbers games and scratch tickets to suckers, my bookie had always given me a fair chance to win. But I was reluctant to climb into bed with Giuseppe Arena. As head of the Patriarca crime family, his interests included truck hijacking, union corruption, prostitution, arson-for-hire, money laundering, and New England’s biggest luxury-car-theft ring. Still, I was growing anxious about how I’d manage to pay the rent and keep my ancient Ford Bronco fed with gas and junkyard parts once The Dispatch was done with me. My young pal Edward Anthony Mason III—trust fund baby, son of The Providence Dispatch’s former publisher, and first journalist laid off when the paper’s new owners took over last year—was dangling a reporting gig at his online local-news start-up, The Ocean State Rag. But the venture wasn’t making any money yet, so the job didn’t pay much. A standing offer to join my old buddy Bruce McCracken’s private detective agency would pay better, but it wasn’t journalism. But bookmaking? Now that was real money. I could replace the torn sofa I’d found on the sidewalk, buy myself a new Mustang convertible, move into a luxury condo on the bay, start an IRA. Maybe even invest in some Red Sox T-shirts that weren’t adorned with cigar burns and pizza grease. “Have you broken the news to Mario yet?” I asked. “Probably doesn’t pay much,” I said. I took a pull from my beer, tipped my head back, and thought about it for a moment. He called me daily after that, usually right around midnight. I should have stopped provoking him, but I didn’t. Sometimes I just can’t help myself. So after work last Friday, I found my Ford Bronco vandalized in the parking lot across from The Dispatch, although with all the old dents and rust, the new damage matched the décor. And to night, before I came home and found the snake, Mario caught me staggering out of Hopes after last call and pointed a small nickel-plated revolver at me. He was pointing the gun at my belly when he said it. I wasn’t sure if he was confused about human anatomy or just a lousy shot. Confident that he’d made his point, Mario brushed past me and pimp-walked away down the sidewalk. As I turned to watch him go, he shoved the pistol into his waistband and pulled his shirttail over it. I decided not to take any more chances. The next time we met, Mario wouldn’t be the only one packing heat. My late grandfather’s Colt, the sidearm he’d carried for decades as a member of the Providence PD, used to hang in a shadowbox on my apartment wall. I’d taken it down and learned how to shoot a few years ago after my investigation into a string of arsons in the city’s Mount Hope section provoked death threats. But Grandpa’s gun had a hell of a kick and was too large for easy concealment. So the day after that encounter with Mario, I splurged three hundred bucks on a Kel-Tec PF-9 at the D&L gun shop in Warwick. The chopped-down pocket pistol was five and a half inches long, had an unloaded weight of just twelve and a half ounces, and tucked comfortably into the waistband at the small of my back. Beyond ten yards, I couldn’t hit anything smaller than Narragansett Bay, but I didn’t figure on doing any sharpshooting.